Home > Major UFO Incidents > The Year That UFOs Buzzed Washington, D.C.
1952 was an extraordinary year in the history of the UFO phenomena. Since it had leapt into the public consciousness following Kenneth Arnold's sighting in 1947, closely followed by the strange events in Roswell, New Mexico, awareness of "flying saucers" and aliens had become almost pervasive in many countries around the world, including the United States. The phenomenon was still new, mysterious and exciting. News media took it far more seriously than they do today and some politicians were willing to talk about extra-terrestrials openly. Still, there was no official acknowledgement from those in power that the UFOs were real. Then it happened. The UFOs started buzzing the capital of the most powerful country in the world - as if flaunting their own existence, almost taunting the timidity of the men who wished to keep it secret. 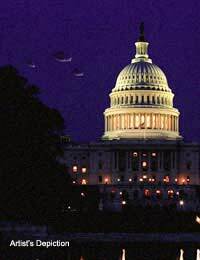 Much of the American news media had a presence in Washington D.C., of course and the episode resulted in flying saucers receiving some of the most candid coverage ever from highbrow organs which didn't usually stoop to such things. The Washington Post lives in legend as the newspaper which brought down Richard Nixon through its coverage of the Watergate scandal. Not exactly the kind of prestigious journal in which you would normally expect to find headlines like "'Saucer' Outran Jet, Pilot Reveals," is it? But that headline did indeed appear in a story in the Washington Post on July 28th 1952, and there were others of a similar nature about the aliens. UFO aficionados have often said that, in order for the mainstream media to acknowledge the existence of UFOs, flying saucers would have to land on the White House lawn. Well, in 1952, the aliens almost did. The Incidents That Happened In Washington, D.C. It started around the middle of July, in 1952, when aircraft pilots and other qualified personnel began to report strange things: visual sightings of glowing flying objects, moving almost playfully around the sky at frightening speeds. Almost every day brought a new report about these possible ETs. Soon they were detected on radar: blips on the scope, moving in a strange, balletic fashion, dancing around in little patterns before zooming off at extraordinary speeds. Jet fighters were scrambled to investigate. As they approached, the blips disappeared. When the fighters returned to base, the ET blips came back again. The pattern of sightings and radar detections continued before culminating on the 26th July. Radar controllers at National Airport and at Andrews Air Force Base picked up the same signals: 6 - 8 blips moving in the, by now, familiar fashion. F-94 jet fighters were sent to investigate. At first, the UFOs acted as they had done before - disappearing until the military jets left the scene, then re-appearing. But this time the military aircraft came back and the blips remained. Some of the pilots sighted the flying saucers visually and gave pursuit. But going after the ETs was hopeless. The UFOs easily outpaced them. America was in uproar over what was going on. It was headline news everywhere and talk of aliens was on everyone's lips. The Air Force was being bombarded with questions - and they didn't have many answers. In a press conference which has been described as a master-class in bureaucratic obfuscation, an explanation was offered that had nothing to do with aliens: what had occurred was nothing more than a "temperature inversion" which caused radar equipment to malfunction and wrongly perceive objects on the ground as being in the sky. The pressmen wrote it up the next day and it seemed to quiet things down a bit. Sightings continued over Washington D.C. for a few more days before tailing off. So What Really Happened With The UFOs? The 1952 UFO flap was one of the most significant in the history of the phenomenon. It brought a large number of mutually corroborating reports from highly qualified observers, and included both visual sightings and instrument detection. The wave of reports catapulted the subject of UFOs and extra-terrestrials into the mainstream for the first time, forcing journalists, politicians and military leaders to address the subjects of aliens and flying saucers in some way. Unfortunately, the way that they chose was to offer a contrived and unconvincing pseudo-explanation of why the apparent mystery really wasn't one. Many journalists, perhaps overly respectful of government authority figures, accepted the explanation uncritically - setting the pattern for a future of government denial and press acceptance, when the subjects of UFOs and aliens was once again relegated to the fringe.